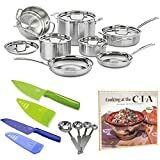 My Best Budget Cookware Reviews includes 2 very reputable brands. Covering stainless steel and aluminum nonstick, every household on a tight budget will enjoy these cookware items. I have and use these items regularly and they continue to impress me in their quality. While they don’t have features higher priced products offer, they are excellent for everyday cooking. I have 3 criteria for my best budget cookware reviews. It’s a tall order, but I am pleased to have 2 products I can solidly recommend. They must be durable and able to last a long time. Just because it’s low priced cookware, I don’t want it to be cheap quality. I want it to last, and that’s why I tested these products regularly. They must be priced under $10 per piece. I already have a low priced category which covers under $20 per piece, so the budget category must be significantly lower priced than that. $10 or less per piece. They must have a history or performance as gauged by many other users. I want to see plenty of reviews where cooks were pleased with the performance, and very low amounts of unhappy users. That’s a tall order for a budget category! KitchenAid is famous for making consumer oriented cookware. 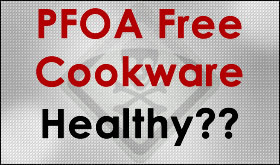 While they are famous for their mixers and food processors, their cookware is equally good but for a different market. With an enamel exterior, aluminum core, and nonstick interior, it is attractive and durable. My experience with using this KitchenAid cookware is that as long as you wash it by hand, and don’t use it on very high heat, it will last a very long time. The nonstick surface has endured much and still performs like a champ. For more details, please see the full cookware review. Farberware classic stainless steel cookware was likely in your parents home. This product line has endured throughout many years with a few changes. Today Farberware Classic Stainless Steel cookware has a cap on the bottom encasing the aluminum versus having the aluminum raw on the bottom. They have added features like drip pour spouts and straining lids. While we all have fond memories of a time long ago, the new Farberware Classic cookware is still very good. To tell you how good the product line is, I am still using a 4qt sauce pot that my parents used over 40 years ago! My newer 1 qt pot I use regularly for oatmeal or soups. I do like the straining lids. While the stainless steel pieces are healthy and dishwasher safe, the nonstick skillets are not. Please hand wash those items. The 17 piece cookware set below is very complete for anyone getting started or just looking for a complete outfit. This set even includes mixing bowls. It’s hard to go wrong with Farberware Classic. For more details please see my complete review. 18/10 stainless cooking surface does not discolor, react with food, or alter flavors. Cool Grip Handle Solid stainless steel riveted handle. Tightfitting cover seals in moisture and nutrients for healthier, more flavorful results. Delivering cooking for today's health-conscious cooks! Exclusive Culinary Ceramica Nonstick Technology is PTFE/PFOA-free and the petroleum-free ceramic-based nonstick interior helps to reduce oil consumption and preserve the environment. 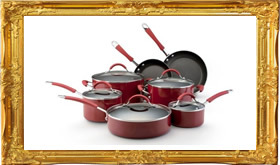 This set has professional true tri-ply construction that features an aluminum alloy core bonded to an induction-ready stainless steel exterior and a stainless steel interior with our Exclusive Cuisinart Ceramica nonstick surface for superior heat conductivity. The Cuisinart Ceramica nonstick surface makes it easy to cook low-fat meals and the superior construction is suitable for all stovetops. Brushed stainless steel exterior gives a professional look and performance. Riveted stainless steel stick handles stay cool and are made from 70-percent recycled stainless steel. Our packaging is made up of 100-percent recycled materials and is printed with soy ink.